Today is the 200th anniversary of Charles Dickens’ birth. Dickens was one of the all time great English writers. At least that is what I am told by my colleagues who teach English literature. I cannot affirm their judgment, since I have never read any of Dickens’ many novels. Even if I had read them, the whole or just part of the cannon, I am not sure whether my opinion would be worth much. Whenever I mention my lack of familiarity with Dickens’ novels in the company of educated people, I am invariably met with looks of shock, pity, or even distain. Occasionally, not often, I will go on to say that neither have I read anything by Mark Twain. If I try to explain away my ignorance by mentioning that I live in Mississippi, I am quickly given a list of the many outstanding authors who were, or are, Mississippians. William Faulkner, Eudora Welty, and Walker Percy are just a few names that instantly come to mind. For the past eighteen years I have worked across the street from Eudora Welty’s home. Oh, and of course I must mention the fact that the National Book Award in fiction for 2011 went to Jesmyn Ward for Salvage the Bones, her first novel. Ms. Ward is a young writer from DeLisle, Mississippi. My first exposure to Charles Dickens was watching A Christmas Carol on the silver screen. It would have been the 1938 or 1951 versions. I was eight or nine years old at the time. I remember that it was in black-and-white, and that I did not like it. Since then, I think I have seen all the various versions, most more than once. I have even seen it done as a play performed by a professional company and a group of elementary school children. It [Coketown] was a town of red brick, or of brick that would have been red if the smoke and ashes had allowed it; but as matters stood, it was a town of unnatural red and black like the painted face of a savage. It was a town of machinery and tall chimneys, out of which interminable serpents of smoke trailed themselves for ever and ever, and never got uncoiled. It had a black canal in it, and a river that ran purple with ill-smelling dye, and vast piles of building full of windows where there was a rattling and a trembling all day long, and where the piston of the steam-engine worked monotonously up and down, like the head of an elephant in a state of melancholy madness. It contained several large streets all very like one another, and many small streets still more like one another, inhabited by people equally like one another, who all went in and out at the same hours, with the same sound upon the same pavements, to do the same work, and to whom every day was the same as yesterday and to-morrow, and every year the counterpart of the last and the next. Now if reading a novel filled with that sort of imagery doesn’t ruin your day, I wonder what would? Like most high school students of my generation before the collapse of public education in America, I was assigned readings from Dickens. I cannot remember which, perhaps because I did not read them. Neither did I read George Eliot’s Silas Marner, another very depressing and boring novel forced upon me when a junior in high school. Why did high school English teachers seem to always assign such depressing stories? Was it their intent to destroy any desire to read on the part of their defenseless students? 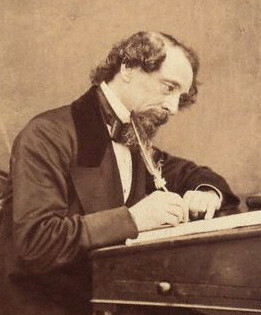 This morning I read an essay by Pauls Toutonghi, “Charles Dickens and the Facebook generation,” on the website Salon.com. Toutonghi is celebrating Charles Dickens’ 200th birthday. He is a great fan of Dickens, but it was not always so. Toutonghi resisted reading Dickens while growing up, something he now laments. He informs us that he was thirty years old with a Ph.D. in English Literature from Cornell, when he read his first novel by Charles Dickens. It was a copy of David Copperfield, given to him as a birthday present by an older brother. Since that first experience with Dickens, Toutonghi has become a devoted fan. He is currently reading all of Dickens’ novels in chronological order, I suspect in tribute to Dickens’ 200th birthday. Perhaps I will one day be tempted to read a novel by Charles Dickens or Mark Twain. Perhaps I will discover that I have been missing out on something most enjoyable. Recently I read J. D. Salinger’s Catcher in the Rye, and F. Scott Fitzgerald’s The Great Gatsby, more than a half century after they were on the best seller list. I wish I had read them sooner, much sooner, but Charles Dickens? I really don’t think I will ever be that desperate for something to read. This entry was posted in Opinion & Editorials and tagged Charles Dicken, Christmas Carol, Dickens, Eudora Welty, George Eliot, J. D. Salinger, Mark Twain, Pauls Toutonghi. Bookmark the permalink. Charles Dickens did take something of a depressing tone with his novels, but he was trying to point out the disparity between the rich and the poor of his day. But you’re missing a lot by not reading at least some of his work. Oliver Twist is probably the least depressing. What I really like about it is how interesting the villians are. As for Mark Twain, there’s nothing depressing about his work. High School English teachers don’t intend to assign depressing stories, rather they assign books that have changed the world. It just happens that the books that point out the problems that need to be solved deal with the worst problems mankind faces. I was never a big Charles Dickens fan either. However, I loved The Great Gatsby, one of my all time favorites. I don’t like to read depressing novels either. You should really read The Sound and The Fury by William Faulkner. . . also some of his other titles as well like Absalom, Absalom. He is an author who realy makes your brain exercise when you read his novels. Thanks. I do intend on reading something by Faulkner. The former curator of Faulkner’s Rowan Oak, Howard Bahr, teaches creative writing at Belhaven University, where I teach history. Mr. Bahr is a very gifted writer, one of many that Mississippi has produced. I encourage you to read his most recent novel, Pelican Road (2008). I might have to look that book up Dr. Waibel. Hopefuly after college I will be able to find time to read other things besides my textbook lol. I’ve also yet to read Dickens and while I feel slightly compelled to, I also suspect that I won’t like him very much. Nor, have I read The Great Gatsby or The Catcher in the Rye yet… I guess I’m just waiting until there’s nothing else left on my ‘to-read’ list… So it looks like I may be waiting for quite a while. However, I have read several of J.D. Salinger’s short stories and I did like “A Perfect Day for Banana Fish” and “To Esme with Love and Squalor”. If you liked The Catcher and the Rye, you might enjoy those as well (they’re both from his collection of short fiction, Nine Stories). I have read “For Elsme” a number of times. It is one of my favorite shor stories. I’m not sure why, but I do like it.